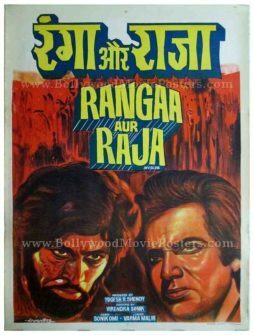 Vintage hand painted Bollywood poster of the Hindi film Ranga Aur Raja (1977) for sale. Printed and circulated during the first release of the film (late 1970s), this old Hindi movie poster for sale was originally designed for publicity of the film but never ended up being used. This old Bollywood poster was originally hand painted on canvas by a well known art Studio called Loomba Arts and features a printed signature of their name on the bottom left. The lead characters of the film appear in striking hand painted portraits on either side of this old Bollywood poster. The character on the left is seen in a bearded avatar whereas the one on the right appears clean shaven, giving away the contrasting nature of the two lead actors in the film.